The Australian Ballet Regional Tour of 'Giselle'. Photo by Jeff Busby. Love conquers death in this glorious revival a blend of the Dame Peggy van Praagh and Maina Gielgud versions of Giselle for The Australian Ballet. 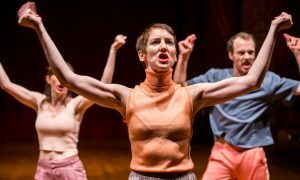 This was part of a regional tour by the company (this section of the Ballet used to be called The Dancers Company) to give young dancers experience, and it was gloriously performed. 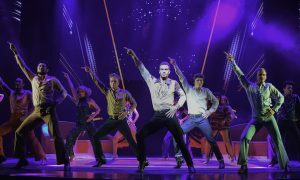 The leads were danced by soloists from the main company. Karen Nanasca in The Australian Ballet Regional Tour of ‘Giselle’. Photo by Jeff Busby. First performed in 1841, Giselle is regarded as a classic, a testing “Hamlet of ballet” for the ballerina in the lead role and is considered the epitome of Romanticism, along with La Sylphide. The story is that of a doomed romance that is set in the world of the living and the dead. The first act, showing village life at harvest time, is grounded in the real world; the second, set in a ghostly forest clearing at midnight, is full of spooky moonbeams. The atmosphere for each act must be completely different. Peter Farmer’s set design for Act I was charmingly simple – Berthe and Giselle’s cottage on the left and a shed on the right. Act II is a mysterious woodland glade with Giselle’s cross. His costume designs for the first act are mostly all autumn/russet colours, a notable exception being Bathilde in white and silver. 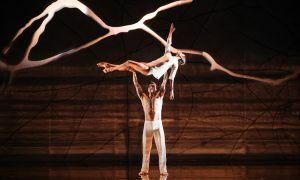 The Australian Ballet Regional Tour of ‘Giselle’, featuring artists of TAB. Photo by Lynette Wills. 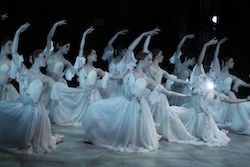 As Giselle, Valerie Tereshchenko was fabulous. 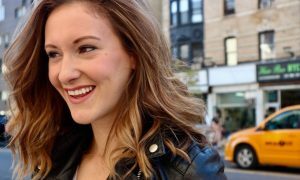 At the start of Act I, she was bright and sunny, buoyant and bouncy, especially at first all giggling and blushing when billing and cooing with Albrecht. Belle of the village, she is well mannered and vibrant, sweet and trusting. Yet there is always the undertone of her fragility and bad heart – Berthe, her mother, is right to be worried. Tereshchenko performed the pas de deux in both acts gloriously. The famous “mad scene” was very well done, quite chilling – Giselle’s mind is shattered, and she looks blankly at her friends. In Act II, yes, she was an ethereal apparition – mostly invisible to Albrecht, but he can sense her. There are lots of acrobatic, high flying, floating lifts, especially in Act II. The pas de deux, especially in Act II, were magic. 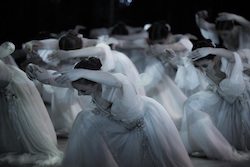 The Australian Ballet Regional Tour of ‘Giselle’. Photo by Jeff Busby. Our Albrecht was excellent. Brett Simon portrayed him as a young nobleman caught in circumstances beyond his control, genuinely in love with Giselle. He was dashing, princely and charismatic, a fine partner, with magnificent jumps and entrechats (absolutely splendid solos in Act II). He has to acknowledge his aristocratic lineage and responsibilities when confronted with them, yet we feel his anguish as he confronts Giselle’s onstage death. Simon plays him as a carefree, rich young man, not deliberately plotting and malicious but someone for whom the consequences of his actions have never been much of an issue. He is almost overcome by Myrthe’s cold command to dance himself to death – Giselle only just manages to save him. The feverish entrechats and cabrioles drive him to exhaustion. Nicola Curry in The Australian Ballet Regional Tour of ‘Giselle’. Photo by Jeff Busby. Isobelle Dashwood as Myrthe was excellent – tall, elegant and commanding, with fabulous jumps and soft ballon. Her opening bourée-ing solo was haunting and imposing; she was otherworldly aloof and mysterious. She was cold and implacable, refusing to listen to either Hilarion or Albrecht’s pleas. As the poor forester/gamekeeper Hilarion, somewhat rough and untutored, also in love with Giselle, darkly handsome Matthew Bradwell was terrific and in fine form. He is absolutely shattered when Giselle suicides and blames himself for revealing the truth. As Berthe, Giselle’s mother, Jasmin Durham was excellent, the spooky warning of the story of the Wilis quite chilling. The corps de ballet of Wilis in Act II were excellent and at times menacing, mysterious and ethereal, breathing and pulsating as one. It was interesting to observe how there were hints of the choreography in Act II for the Wilis within Act I. 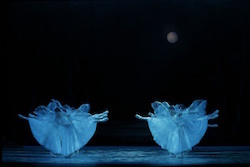 The “peasant pas de deux” in Act I here became a peasant ensemble, with three other dancers sharing the male choreography, as led by Evie Ferris and Takahiro Tamagawa. 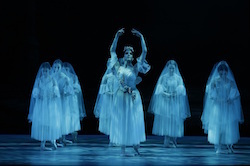 The Australian Ballet’s production of Giselle was a most wonderful revival of this much loved elegant classic.